Since our Cook is on Vacation for almost a month, Me and my Brother rotates as cooks (it's just my second time though). 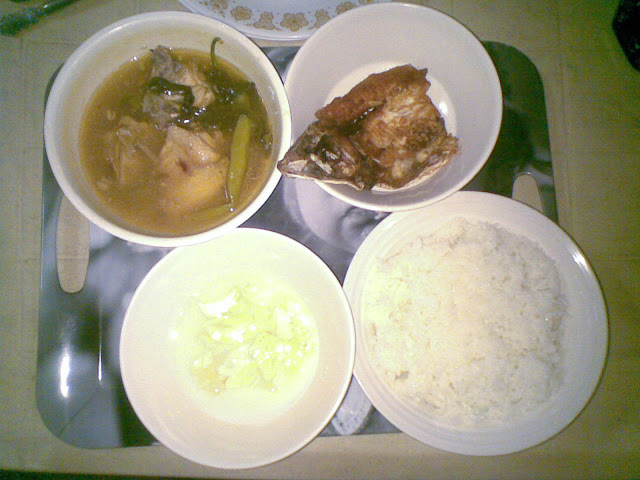 For Dinner, I cooked Sinampalukang Manok or Chicken on Tamarind Soup and Daing na Bangus or Dried Butterly cut Bangus. Cooking Sinampalukan is quite easy. Just Sauté Ginger and Garlic until Golden Brown then Add the Onions and the Chicken. Cook for about 10 minutes until the Chicken gets Tender. Add about 7 cups of Water. Bring to Boil for about another 10 Minutes then add the Tamarind Base Soup Mix together with leafy veggies of your choice. Let it simmer for about 5 minutes and your soup is ready to be served! Preparing the Daing na Bangus is quite a difficult job which includes De-boning, Sun-drying and and Seasoning it taht is why Commercialized Daing are being sold on Supermarkets and even on the Streets here in the Country but of course, Preparing it yourself makes the Bangus extra special. This one, it was given by our Aunt and all I did was to Fry it. You can make it as Tender or as Crispy as you like!